I try really hard not to contact awesome retailers for product samples, because, well, I feel like it cheapens the whole experience. But when retailers contact me with beautiful, tzniut products, I can't turn them down, and I never have! Thus, I'm excited to share with you a retailer that I've been hoping and praying would contact me for some time now (ever since I moved into Teaneck and heard about it, that is), and that is The Style Underground, the fine purveyors of innovative, classic, and modest hairwear and headgear. 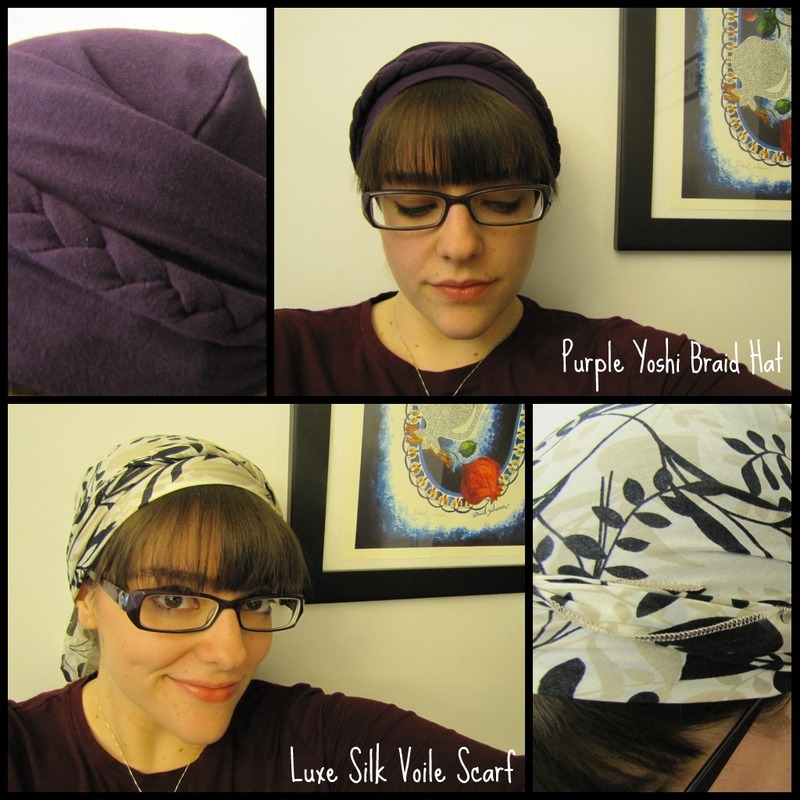 Julie at TSU contacted me and sent me two amazing products: A Purple Yoshi Braid Hat and the Luxe Silk Voile Scarf. I'll admit it -- when the package came, it was small and well wrapped, and I was concerned. Will her products fit my gigantic German noggin? Yes, I have a big head, and it's always caused me woe and drama when it comes to buying hats, which is why I don't really wear hats outside of winter when slouchy, knit hats are oversized and comfortable. If I had my way, I'd wear comfy hats all year round, so consider me stoked to discover that TSU makes a comfortable, stretch-cotton hat, called the "Yoshi Braid Hat." The Yoshi Braid Hat is what it says -- it's soft, cotton, and stretchy, but without that "you wore it once and now it's stretched out" kind of feeling. 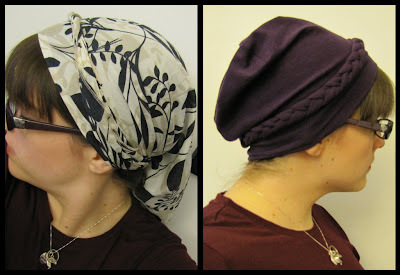 It was comfortable, looked like a tichel (according to Tuvia), and it provided versatility, as the braid is attached in the back but is able to be moved around on the crown of your head. I was incredibly excited the moment I put it on -- I felt like summer wouldn't be so bad after all! My only concern is that, because my noggin is so big, the hat doesn't look exactly like it does on Julie on her website. It's just a little too snug to look casual. As Tuvia said, from the side I look like an elf. I tried to rectify the situation by pulling and tucking the extra fabric in, and it worked for the most part, but I noticed throughout the day that I did suffer some slippage of the hat because, well, of my gigantic head. (I know, I know, it doesn't look that big, but it is.) Overall, however, I'm super excited about the hat, and I'm excited to buy the other colors (especially the versatile black!). The Luxe Scarf at first glance had me thinking that this wasn't anything special, but then I unwrapped it and ... holy wow ... it's shaped like a triangle! Which means there isn't gobs of extra fabric to try and tuck away, and it makes it easier to leave the part around the neck out without it reaching half-way down my back and making me look like a peasant. The fabric is incredibly lightweight and comfortable -- it honestly feels like I'm wearing nothing on my head, which is perfect in time for summer. The stitching on the scarf, too, is impressive. I can't use a sewing machine, let alone make something this elegant. Overall, I have to say I am very, very impressed with what The Style Underground has to offer. I was taken aback at first by the prices, but after receiving the products, I can tell you that it is beyond worth it. The product is elegant, the stitching is expert and flawless, and the color options are innovative and seasonal. I'll be wearing these for years, and they won't show the wear, either. We're talking Boutique Tzniut, folks! And I'm sold. Do you have a favorite The Style Underground scarf or hat? Let me know what you think! EDIT: Don't forget to check out the invaluable resource of The Style Underground's scarf-tying videos on Facebook!